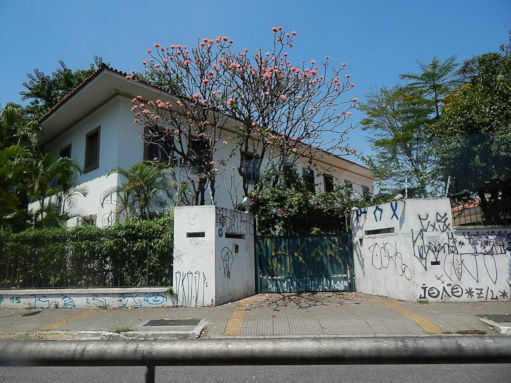 Contradiction between everyday life and the statistics – What a terrible phenomenon that undermines the Catholic population itself, and which leads the Brazilian spirit, unfortunately so accommodating, to a monstrous situation. We are a nation with an overwhelming Catholic majority. Statistics in fact show a near unanimity of Catholics in Brazil. 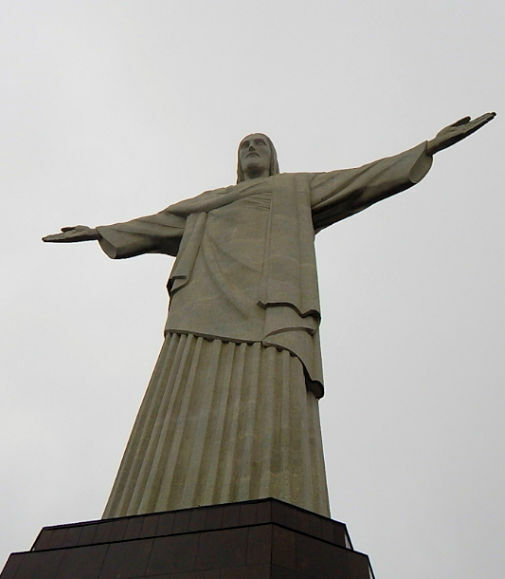 If we examine the morality of Brazilian public life, however, it is as if God did not exist. If we examine our social life, we will see that its morality is almost as if God did not exist. If we examine our domestic life, we will see that day by day it is becoming the way it would be if God did not exist. Nevertheless, the churches are filled, acts of worship continue are well attended, and at census time, it is undeniable that everyone claims to be a Catholic. How to explain this? Only this silent corrosion, this discreet, silent corrosion, terrible as leprosy, resulting from this state of spirit that organizes the world abstracting from God, this state of spirit that conceives all things in the shadow of the Revolution and disorder, that organizes everything based on sensuality, which is itself disorganization. Common sight in affluent Brazilian neighborhoods. If a country like Brazil, so worthy of better days, writhes today in one of the gravest crises of its history, it is because it lacks morality. It is because it lacks the coherence between the Faith and daily life. It is because we have the tendency, which unfortunately increasingly overwhelms us, to adore God Our Lord with words alone, saying “Lord! Lord!” and then to live as we choose. Having thus defined the various meanings of the word “modern,” we can ask what is the role of this modernity in the modern world. We could say that this mentality which calls itself “modern” has not conquered everything in the world today. It is the great propelling force behind almost everything. It is the great distinctive note today. It is also the great danger. And, while it would be exaggeration to argue that only this miserable modernity exists in the world today, it would be blindness and madness to deny that it is the strong and decisive note. It is also true that in this world increasingly dominated by this spirit, Someone eternal is present: Our Lord Jesus Christ. Someone who is present in all the tabernacles of the earth—in those that are golden as well as those that are poor, and even in those that are hidden in countries behind the Iron and Bamboo Curtains. But this Someone whose Presence is not perceived by our bodily senses, is the great Apostle of the world today, as He is throughout history. He speaks continuously to souls, teaching them in the silent, but infinitely efficacious language of God. God speaks constantly about the need for man to oppose those things which are his misery, his degradation; on the need of changing course; of building his life on God, sacrifice, renunciation, acceptance of authority; of turning to God and converting with his whole heart. That, which happens every time man challenges God, happens in this terrible modern world as well. God multiplies His marvels, and as iniquity reaches its apex, we see admirable fruits of the Blessed Sacrament, fruits of grace, fruits that bring incomparable results to the apostolate. While entire multitudes head to pleasure and vice, become cowardly and silent in the face of evil, we see an ever increasing number of souls who long for absolute perfection, total orthodoxy, full obedience to the Catholic Church. 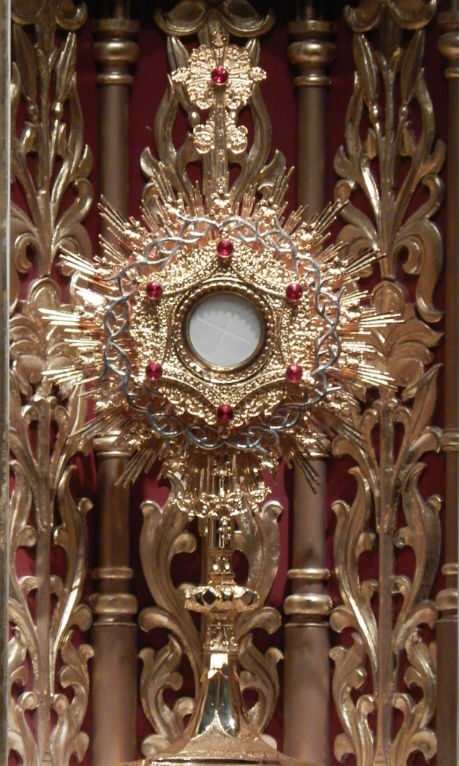 Souls who abandon everything, are ready to challenge and confront everything, and to affirm in all simplicity the doctrine of the Church, to suffer and prevail over everything for love of Our Lord Jesus Christ present in the Blessed Sacrament. 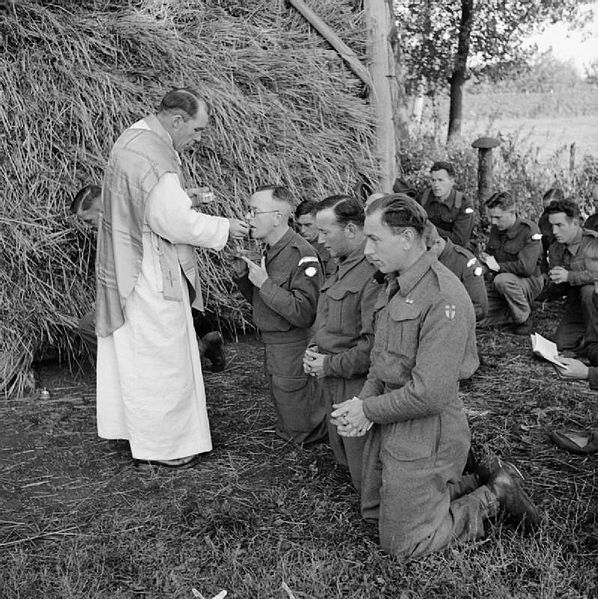 Father C V Murphy says Mass in a Dutch field in the front line, October 6, 1944. Saint Maria Goretti – At this point, it is impossible not to recall the angelic figure of Saint Maria Goretti. Today, when beaches are filled with a neo-paganism that broadcasts the corruption of modern civilization, this young virgin resolutely surrendered her life in order not to lose that which she loved more than anything else—more than the light of her eyes, more than her very existence—that virginity which one learns to love as life’s most precious gift, when one has a truly eucharistic soul. Saint Maria Goretti life is a crowning example. But is this a solitary fact? The Viennese member of the Marian Congregations – How much heroism can be seen in Western and Eastern countries alike! There is the case of a member of the Marian Congregation of Vienna. Being wheeled in for surgery to have his tongue removed, he made a sign to the doctor that he wanted to say one last word with the tongue he was about to lose forever. The doctor agreed and the room was filled with expectation. Everyone imagined that it would be a request he wanted to make or a last word of kindness for those around him. Some may have thought the poor young man wanted to complain. Amidst the silence and recollection and with great effort, the young man uttered these admirable words: “Long live Our Lady!” And then, having used his last moments of speech to glorify Mary Most Holy, he went forward into the silence that would mark the remainder of his days. Mary Most Holy, whom so many forget and deny, whom so many love less than they should, received in this gesture an incomparable glory. Mary Most Holy raises up legions of soul like this in the modern world. Chapel in Priest block 26 of the Dachau concentration camp. Dachau had a special “priest block.” Of the 2,720 priests held here, 1,034 did not survive. The majority was Polish (1,780), of whom 868 died in Dachau. The boy martyrs of the tabernacle – There is another impressive case. It happened behind the Iron Curtain and was reported in L’Osservatore Romano some time ago. The communists entered a village, which had a Catholic church. 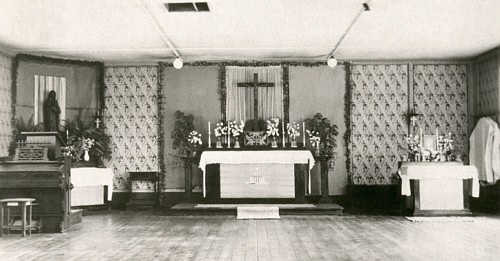 The boys of the village heard that the communists planned on breaking into the church, to vandalize the tabernacle and profane the consecrated hosts. It was dark, and the moonlight reflected marvelously on the snow. The church lay in total solitude. So many of the faithful, terrified, slept in their homes while the church is about to be ransacked. Will Our Lord remain alone in this Garden of Olives? No. All night long three young boys hide inside, having entered through one of the windows. When the communists break in, one of the young boys tries uselessly with his small hands to bar their access to the sanctuary, but he dies under their blows. Another perishes defending the Holy Communion rail. The last one climbs onto the altar to protect the tabernacle with his chest. The barbarians kill this living tabernacle, then break into the golden one, which is worth so much less. They take the sacred hosts and profane them. Hell rejoices, but Heaven does too, and much more, with the blood shed in the church by these three young martyrs. Certainly, their blood is no less glorious than that shed by the martyrs in the Coliseum. At the moment when iniquity is reaching its apex, grace and the mercy of God also reach their apex. In opposition to the “fortitude” of vice and evil, God raises an indomitable fortitude of good. 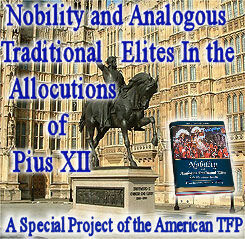 The Catholic Church will triumph in the modern world. For sure this triumph will occur in the gigantic clash between the small forces of good and the enormous forces of evil, but we will see this clash — I believe it will probably occur in our own lifetimes. 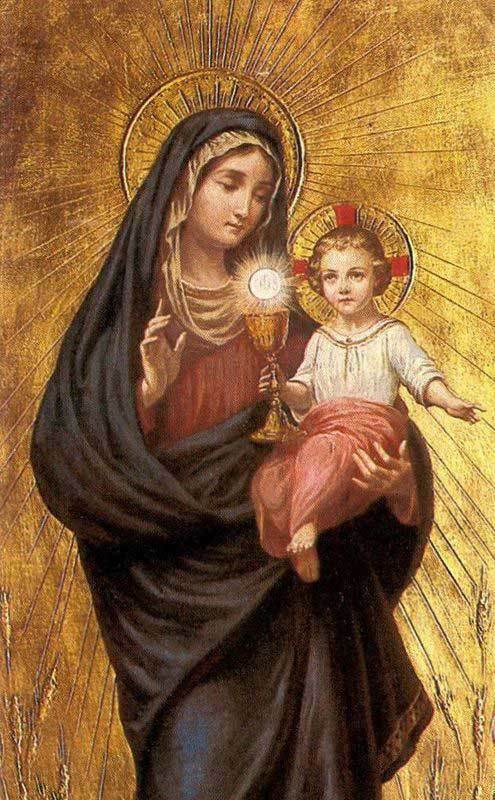 We will see this fact: the Church shall have one of the greatest victories of all time, and this victory shall be the victory of the Blessed Sacrament, the Fountain of Grace that is opened for the world, through the intercession of Our Lady, who praying incessantly to Jesus in the Blessed Sacrament, obtains for us the graces we need. This role of the Blessed Sacrament in the modern world makes us think of Our Lady, and since we cannot speak of triumphs or graces, without speaking of Her, the necessary Mediatrix, I can affirm that one of the most precious gifts the Blessed Sacrament bestows on the world is devotion to Our Lady. And it is this devotion to Our Lady —so characteristic and so deeply rooted in our Land of the Holy Cross— that will save Brazil. (*) See the original text in portoghese: “Anais da Semana Eucarística de Campos – 17 a 24 de abril de 1955”, pp. 101 a 113, A EUCARISTIA E O APOSTOLADO NO MUNDO MODERNO, na Sessão Solene da Semana Eucarística de Campos (Rio de Janeiro).